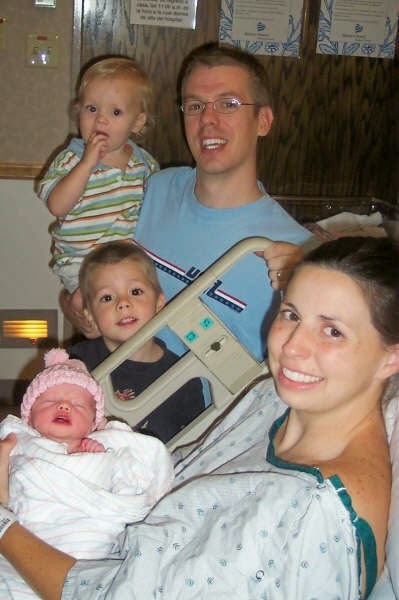 Macey Claire Johnson was born at 7:39 am on Thursday, July 26, 2007, weighing in at a petite 5 pounds 15 ounces and measuring 18 inches. It hasn't been that long since Matthew joined us, but he's already running around excited to be a big brother. In fact, we are all excited about this new beautiful girl joining our family. Michael continues to be eager to hold her, bring her toys, and help take care of her in any way. I think she will be well taken care of by her big brothers. Well, here we go again. Sara is ready to be rolled into the OR and as you can see I'm all dressed up and ready for my difficult role of holding hands, taking photos, and cheering. Take a closer look as Macey waves you a big hello as she enters the world. You may want to click to enlarge this one. I think the OR photos get better with each baby. Ok, time to stitch Mommy back up. Macey is out, all cleaned up, and exhausted. She won't get to rest yet though. Oh, she's so modest. Paris and Lohan could learn a thing or two from Macey as she lays in recovery waiting for Mommy to show up. What a pretty dress Mommy has on! Finally Mommy gets to see what she's been carrying around the last 9 months. Michael is such a good big brother. "Oh, she's so cute! Can I hold her?" She shines like an angel in her pretty white dress. Good thing we didn't use the flash. Simply asking these boys to say 'cheese', turns into a heated competition on who can say it the loudest. CHEEEEESE!!! Welcome to my crib! This quilt and bumpers were custom made by my Mommy. She's been working so hard to get this room ready for me. Macey seems quite happy on her new quilt. Those two blue surf boards are each from fabric from each brother's quilt. "Wasssup!" Isn't she so elegant and refined already. She thinks she's so funny. Rest up, Mommy. You're gonna have your hands full when you get home trying to take care of this new girl and these three boys.